Dr. Singh is the Section Chief of Body CT, University of Massachusetts Memorial Medical Center, and Staff Radiologist, Massachusetts General Hospital. Dr. Sagar is a Fellow in Pediatric Radiology, Massachusetts General Hospital, Boston, MA. Dr. Shirkhoda is the Chief of Body Imaging, Dr. Gupta is a Resident in Radiology, and Dr. Lal is a Staff Radiologist, Department of Radiology, William Beaumont Hospital, Royal Oak, MI. Magnetic resonance imaging (MRI) is the imaging modality of choice for the initial imaging and posttreatment follow-up of sarcomas. Though imaging alone cannot usually reliably predict the histopathologic diagnosis or distinguish benign from malignant processes, imaging features, along with clinical history and epidemiologic knowledge of various tumors, can help narrow the differential diagnosis. This review of sarcomas of the upper extremities addresses the imaging features of soft tissue as well as bone sarcomas. Sarcomas are a group of malignant tumors arising embryonically from primitive mesoderm. The primitive mesenchymal tissue within the mesoderm differentiates into various connective tissues of the body, ie, tendon, ligament, muscle, and bone. Tumors of these connective tissue elements are referred to as sarcomas. The differentiation is not precise and, thus, some sarcomas have ectodermal and epithelial origin. The majority of sarcomas arise spontaneously, though a selected few have associated risk factors. 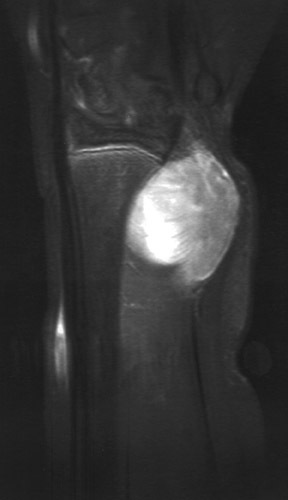 Imaging of any soft tissue tumor should begin with conventional radiography, followed by MRI as a second-line diagnostic technique- before biopsy is performed. 1 A plain radiograph can help to determine if the soft tissue tumor involves bone and to identify vascular calcifications within hemangiomas, ossifi- cation within myositis ossificans, and juxta-articular osteocartilaginous masses within synovial osteochondromatosis. On radiography, MFH appears as a soft tissue mass containing mineralization in 5% to 20% of lesions. 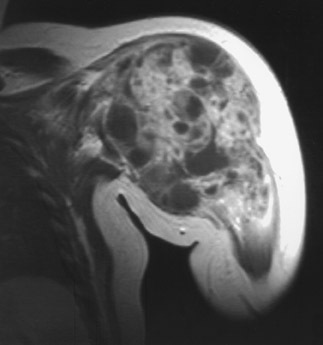 14 On MRI, MFH appears as a well-circumscribed, lobulated, large mass with heterogeneous signal on all sequences due to different histologic patterns within the lesion (Figure 1). On T1WI, MFH has intermediate signal; and on T2WI, the lesions have high signal with marked enhancement on postcontrast images. Similar to synovial sarcoma, deep MFH can cause extrinsic erosion of adjacent bone. On radiography, liposarcoma appears as an indistinct soft tissue mass. 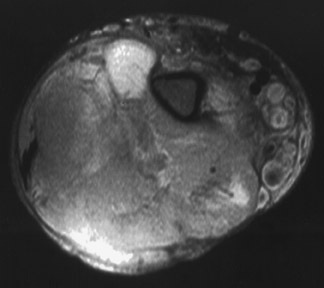 The fatty component may be recognized occasionally; <10% of lesions exhibit calcifications. There are 5 histologic types, and MRI findings vary depending on the type. Well-differentiated liposarcoma (the most common type) appears as a heterogeneous lipomatous mass with nonadipose septal and nodular areas (Figure 2). 14,15 Well-differentiated liposarcoma resembles a lipoma and, thus, shows high signal on T1WI and low signal on T2WI. The nonadipose septal and nodular regions have variable signal and enhancement with contrast. 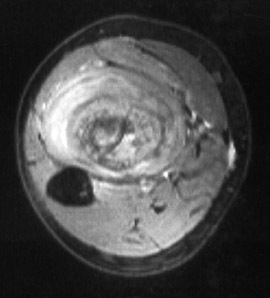 16 The myxoid, round cell, and pleomorphic types have much less adipose component, with only 50% of lesions showing fat characteristics on MRI. Myxoid liposarcomas tend to be homogeneous and may mimic cysts. Dedifferentiated liposarcoma is a bimorphic sarcoma with both well-differentiated liposarcoma components and a second nonadipose sarcoma. Leiomyosarcoma is the third most common soft tissue sarcoma. Leiomyosarcoma has a 1.2-2:1 male predominance and most commonly occurs in the retroperitoneum, closely followed by the lower extremities. They occur in the upper extremities in approximately 5% of cases. The age range is 35 to 79 years, with a mean age of 58. 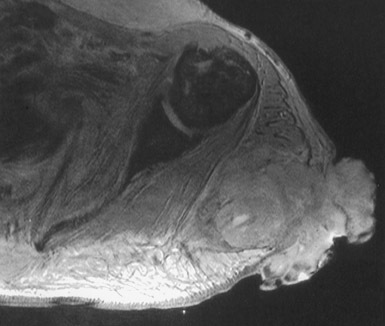 11 In the extremities, they typically present as a solitary painful nodule. On radiography, they appear as an indistinguishable soft tissue mass with rare calcifications or invasion of adjacent bone. 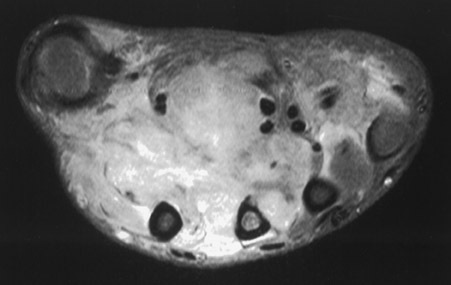 On MRI, they appear as a nonadipose soft tissue neoplasm with areas of necrosis. 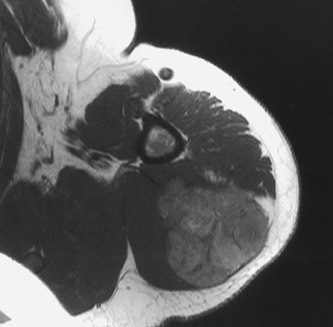 Malignant peripheral nerve sheath tumor (MPNST) is a high-grade sarcoma that accounts for 10% of soft tissue tumors. Malignant peripheral nerve sheath tumors are equally common in men and women. They occur in an age range from 17 to 70 years, with a mean age of 42. 12 They can involve any peripheral nerve, though larger nerve groups are more commonly affected (ie, sciatic). 17 Individuals with NF1 are at increased risk for developing MPNST, and, on average, these patients present with disease 10 years earlier. Between 25% and 75% of patients who develop MPNST have NF1. Radiation exposure has also been associated with MPNST. They most commonly occur in the lower extremities and occur in the upper extremities in roughly 11% of cases. Patients with NF1 typically present with rapid enlargement of neurofibroma, along with pain and neurologic symptoms. 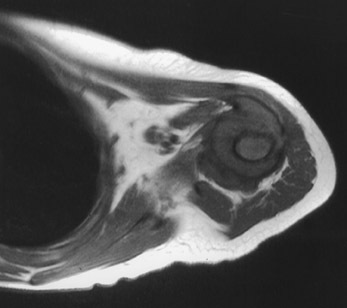 Radiographs may reveal an ovoid or fusiform soft tissue mass. These tumors are rarely mineralized and rarely affect adjacent bone. On T1WI, the MPNST has low signal, and on T2WI, it has high signal. 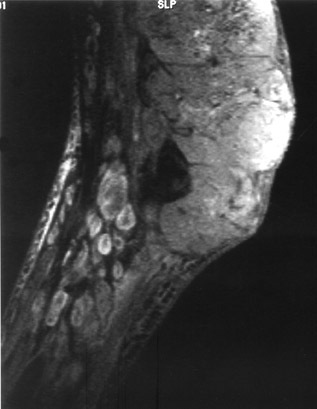 Malignant peripheral nerve sheath tumor enhances brightly on postcontrast images and often has a central dark area secondary to necrosis and hemorrhage (Figures 3 and 4). 18 These tumors are continuous with the involved nerve. 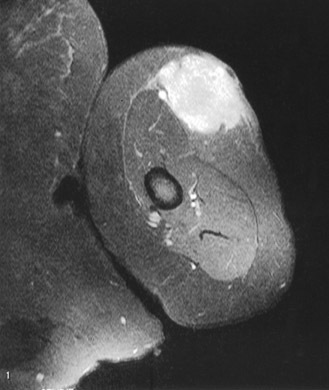 Synovial sarcoma accounts for 5% to 10% of all malignant soft tissue tumors. They occur equally often in both sexes and have a tendency to occur in a younger population, ranging from 14 to 58 years of age (mean age 32 years). They occur in a variety of locations, most commonly in the lower extremities, and involve the upper extremities in roughly 13% of cases. 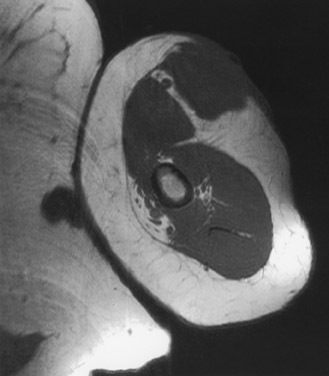 Synovial sarcoma involves the articular surface in only 10% of cases. Radiographs reveal a soft tissue mass in 5% of cases, while the remaining patients have normal examinations. One third of cases have calcifications within the lesion, and 10% to 20% involve adjacent bone. 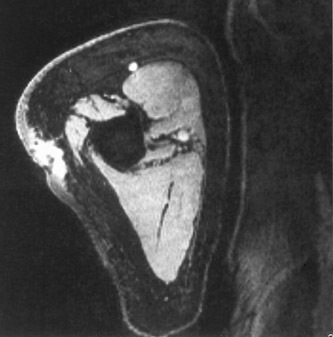 On MRI, there is heterogeneous signal with T1WI indicating isointense signal to muscle. On T2WI, they are heterogeneous with signal ranging from hypointense to hyperintense relative to fat (triple signal). They enhance heterogeneously on postcontrast images, and up to 40% of lesions have hemorrhage. Fluid-fluid levels are seen in 10% to 25% of the lesions (Figure 5). 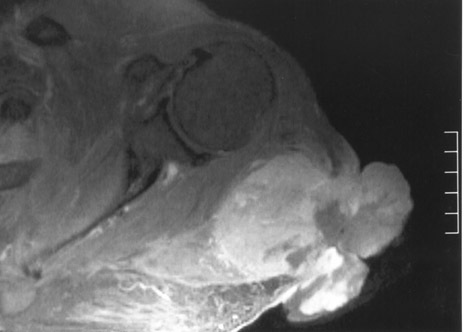 19,20 The MR appearance most suggestive of synovial sarcoma is an inhomogeneous septated mass with infiltrative margins located close to a joint, tendons, or bursa, especially if soft tissue calcification can be seen on radiography. Rhabdomyosarcomas make up 2% of all malignant soft tissue tumors. The male to female ratio is approximately 1.2:1. Their age distribution is from 2 to 40 years (mean age 18), and the 2 peaks of incidence are between the ages of 2 and 5 years and from 16 to 18 years. They occur in a variety of locations, most commonly in the head and neck, followed by the lower extremities; they occur in the upper extremities in 9% of cases. 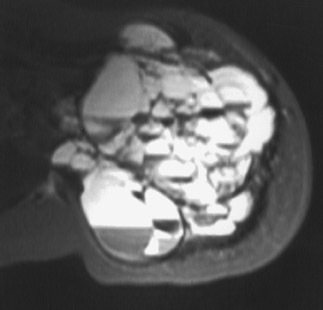 Radiography reveals a soft tissue mass. 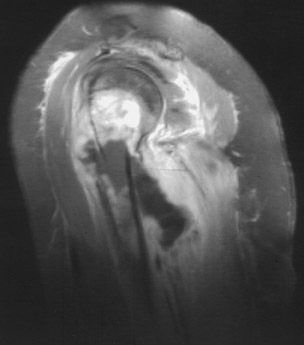 MRI shows a diffuse soft tissue mass displacing adjacent soft tissues. On T1WI, the lesion has low-to-intermediate signal, and on T2WI, it has a high signal with marked enhancement on postgadolinium images (Figure 6). The other soft tissue sarcomas include epithelioid sarcoma (Figure 7) and angiosarcoma (Figure 8). They most commonly occur in young adult and middle- aged men, respectively. Osteogenic sarcoma is the most common primary malignant bone tumor in children; 75% of cases occur between the ages of 10 and 25 years. The majority (86%) of tumors occur in the long bones, with the distal femoral metaphysis accounting for almost half of cases. The proximal tibia and humerus are the next most common sites of involvement. Within the long bones, more than half of the tumors occur in the metaphysis, roughly another third in the metaphyseal/epiphyseal site, and <10% occur isolated in the diaphysis. 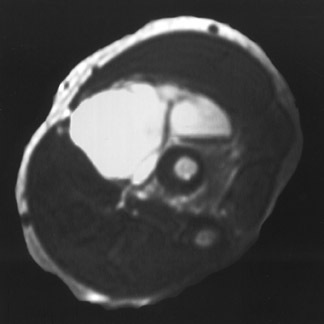 Ewing's sarcoma is the second most common primary malignant bone tumor of children, following osteosarcoma. It is more common in males than in females and has a peak incidence between 5 and 10 years of age. It occurs in long bones (Figure 12) in 50% of cases and in flat bones in 40% of cases. 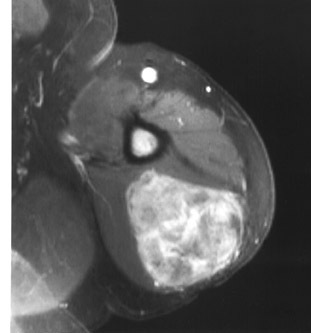 As with osteosarcoma, it occurs in the femoral diaphysis most frequently. Other common sites include the humerus, pelvis, ribs, tibia, and scapula. 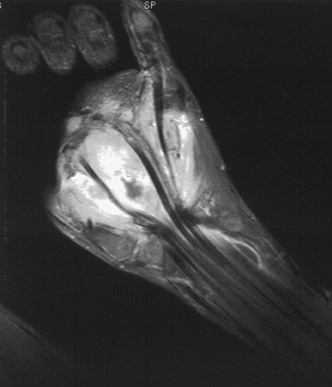 Chondrosarcoma is a primary malignant tumor derived from cartilage cells, which arise de novo, or as secondary chondrosarcoma due to malignant transformation of an exostosis or enchondroma. They have a male predominance and an average age range from 40 to 70 years. They typically develop in the shoulder, pelvic girdles, and proximal long bones, and they typically occur as central lesions within the intramedullary cavity. On radiography, chondrosarcoma is a radiolucent lesion with permeative borders, which often exhibit fluffy/flocculent calcifications, endosteal scalloping, and periosteal reaction. MRI shows low signal on T1WI and, on T2WI, shows homogeneous or heterogeneous high-signal mass with a lobular configuration, with or without thin low signal intensity septa. 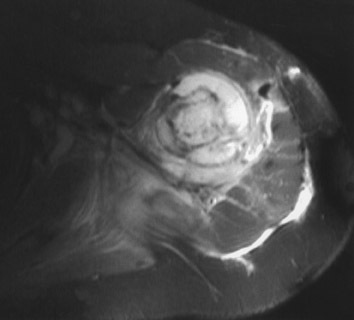 MRI is the imaging modality of choice in the local staging of soft tissue sarcomas and can often differentiate tumor from tumorlike conditions. It cannot always differentiate benign from malignant processes, although it is occasionally strongly diagnostic for several soft tissue tumors. The most important role of MRI for soft tissue tumors is in defining the extent of the lesion and its relationship to adjacent anatomic structures. 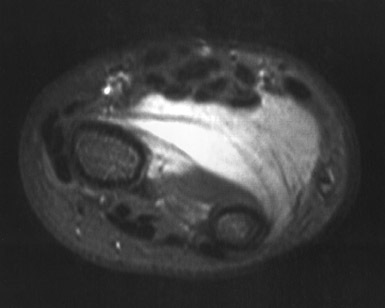 MR imaging of upper extremity sarcomas. Appl Radiol.